The Cambodian government has continued tightening the screws on its already crippled free press, introducing severe prohibitions on election reporting ahead of the ballot in July, and establishing a taskforce to monitor social media posts. Guidelines issued by the National Election Committee (NEC) last month include bans on reporting that causes “loss of confidence in the election”; using “provocative language”; “expressing personal opinions”; and publishing things that affect political or social stability. Unauthorised interviews at polling stations are also banned. Violators will be fined up to US$7400. Meanwhile, a taskforce led by the ministries of Interior, Information, and Telecommunications will monitor social media “to prevent the spread of information that can cause social chaos and threaten national security”. Internet providers will be required to block access to web pages deemed to violate Cambodian law. These prohibitions are just the latest attack on free press in a country that has seen its once vibrant media landscape reduced to rubble over the past year. August 2017 marked the beginning of the end of free press in Cambodia. 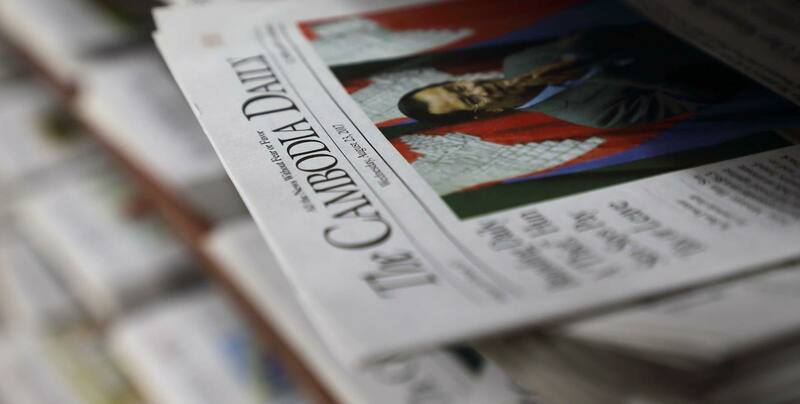 In one month, 32 radio stations critical of the government shut down, and the Cambodia Daily was forced to close due to a disputed tax bill. Radio Free Asia ceased operations in September, citing intimidation and an inability to broadcast. Days later, two of its former reporters were jailed on spurious charges of espionage, and they remain imprisoned. The last independent newspaper, The Phnom Penh Post, was sold last month to a Malaysian PR firm that has previously represented Cambodian Prime Minister Hun Sen (Mourning Cambodia’s press freedom). A representative from the company told reporters at a press conference that journalists should not be critical. Despite holding regular elections since 1993, Cambodia has never been known for credible polls. Hun Sen’s Cambodian People’s Party has won all but one contest in the face of frequent reports of irregularities and even election-time violence. Hun Sen actually lost the first election in 1993, but declared himself co–prime minister before fully consolidating power in a coup four years later. While the NEC has warned journalists against undermining the legitimacy of the election, it is not only journalists but also the Cambodian government itself that is responsible for the loss of faith in July’s polls. In November, the Supreme Court ruled to dissolve the Cambodia National Rescue Party, the only viable electoral challenger (Donor scramble as Cambodia hits undo on democracy). No party other than the CPP and CNRP won more than 2% of the vote in last year’s commune elections. The NEC’s regulations were met with widespread outrage by journalists and civil society members alike. In a statement issued on 4 June, the Committee to Protect Journalists condemned both the NEC regulations and government plans to monitor social media, warning if the restrictions on reporting remain, the elections will have “virtually no credibility as free and fair”. The social media taskforce was established via prakas – a proclamation that is not voted on and goes into effect immediately. While the decree adds no additional legal penalties, the Cambodian criminal code is already riddled with laws that severely restrict free speech. Many political dissidents are arrested on charges of “incitement”, a catch-all crime frequently applied to government critics that carries a sentence of six months’ to two years’ imprisonment. Two men have been arrested in recent months for criticising the King, which carries a penalty of one to five years in jail. Public insult and criticising court decisions are among other forms of illegal speech. Needless to say, more government eyes scanning the net means more Cambodians will be arrested on trumped-up charges such as these. What’s more, for more than a decade the Cambodian government has been drafting an access to information law meant to broaden rights for journalists, to no avail. This makes the government’s priorities clear: while expanding journalistic freedoms must be subject to a laborious 10-year draft period, censorship can be introduced at the snap of a finger. The count in the final undeclared seat in Papua New Guinea’s 2017 national elections has resumed – more than five weeks after polling was supposed to end.